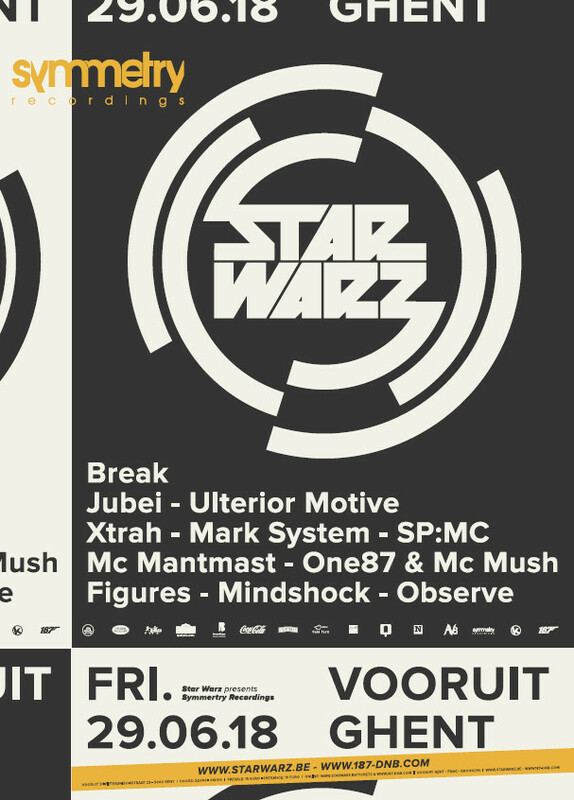 Before their big showdown on Tomorrowland in July, Star Warz will be touching down in their home-base Vooruit on Friday, June 29th. After having hostings from all the leading Drum ‘n’ Bass labels around, this time it’s Symmetry Recordings who will be showcasing their best talents. Launched in 2006, Symmetry Recordings is a Jungle / Drum ‘n’ Bass record label created and owned by producer Break. Releasing a wide spectrum of high quality music the label is home to many of Break's best known solo releases and all of his albums. After 5 years representing solely his own tracks on the label, Break widened the scope of artists in 2011 featuring some highly talented up and coming new producers, with an impressive stable of top name collaborators. Seminal tracks such as "Slow Down" produced with DJ Die and "Don't Look Down" featuring Calyx and Teebee, have helped shape a label into the respected portal supported by many DnB fans across the globe. Break is one of DnB’s most prolific producers, having released music on many of scenes top labels. From his first release in 2003 with A Sides’s Eastside Records he went on to sign tracks to Commercial Suicide, Metalheadz, Soul:r, Subtitles, Shogun Audio and Exit records. His close ties to DNAudio, Quarantine and DJ Die yielded some of the best releases on their labels. Starting his own imprint Symmetry Recordings in 2006 opened the door for full control of his musical output, with 4 solo albums under his belt and a stack of singles and E.P’s. His remix skills have been regularly commissioned, leading to remixes of commercial artists such as Bloc Party, Miss Dynamite and Sigma & Rita Ora. Break was sought out for remixes of classic DnB tracks such as Shy Fx’s Bambaata, Krome & Times’ The Licence, Dillinja’s Hard Noize and a still expanding list of many other top DnB tunes. And also Ulterior Motive are at the top of their game. Their debut album ‘The Fourth Wall’ was exceptionally well received by press and fans alike, with award nominations and UK top 40 chart success following its release. At the end of 2014 the album regularly appeared within top 10 lists across all genres, a triumph for all concerned. As DJs Ulterior Motive have performed at festivals and clubs across the globe to rapturous audiences and are known for their DJ sets from London to Colombia. As producers they’ve remixed notable artists, collaborated with the cream of Drum & Bass producers and have been requested as sound designers for forthcoming projects in new media. In a scene where your music does the talking, Xtrah's is a voice demanding of your attention. The true embodiment of a low end theorist, his sub shaking bass weight and precise ear for beats has played an integral part in Xtrah building a catalogue of releases on some of D&B's biggest labels. His first two releases on the legendary Subtitles imprint gave everyone a taste of Xtrah's stylish production. Critical Music also took notice as did Symmetry boss Break.. Xtrah is the first artist to have a full release on Symmetry with his well received Lost Time EP, featuring DRS, Codebreaker and Break himself. Later there also was a solo release on Ram Records, an appearance on Andy C's Nightlife 6 compilation, followed by a release on Goldie's seminal Metalheadz label. Mark System’s music became loved and supported by the scene’s taste makers including Shy FX who took him under his wing. Mark’s subsequent association with Digital Soundboy Recording Company has resulted in several high profile remixes and solo work for the label to date. Exit Records and dBridge made an ultimate statement of belief, by releasing his debut album 'Final Approach' in Spring 2015. Currently, in both DJing and producing, Mark has distilled his knowledge into the essential elements in order to make a statement. His music is mature and confident yet far from tamed and the intensity of his DJ sets evokes strong emotion. They are attractive, edgy and yet accessible. The multi-faceted MC Mantmast has cemented himself as a regular fixture at label nights both home and abroad for Critical Sound and Metalheadz. Engaging lyricism and intelligent subject matter, executed with clinical delivery are all trademark features of this host’s vocal artillery. This time, he’ll be doing the honors for Symmetry & Star warz! Figures started out as a DJ and promoter in the Belgian Drum ‘n’ Bass scene over a decade ago. As co-founder of the award winning City Flow Music and main promoter for the Drum ‘n’ Bass nights at Ampere club Antwerp, he booked artists of renowned imprints like Goodlooking Records, Signature Records, Exit Records, 1985 Music, Shogun Audio, .... After years of playing as Judah in and around Europe a new and fresh alias to play and produce under was due. Figures takes all past experiences along with him in order to bring versatile and eclectic sets that can (and will) go from hip hop and half-beat to full-on jungle, autonomic stuff, deep liquid and dark steppers. Observe started organizing the Forcefield events together with long time friend Shapi in 2010. Later they joined forces with Panther to form Panther & Observe but decided to go behind the decks alone for the first time at Forcefield. Together they were also the hosts of the Antwerp based concept named Rolling, getting in names such as Bachelors of Science , Hydro , Aries and many more.. Expect a wide variety of tunes from deep and dark up to rolling vibes and off course some jungle flavors to carry you through a journey of drum & bass music.